Today, the UN Committee on the Rights of the Child (CRC) published the “Concluding Observations” of its 73rd Session. • now 13 countries reprimanded in Europe, South America, Asia, Oceania and Africa. 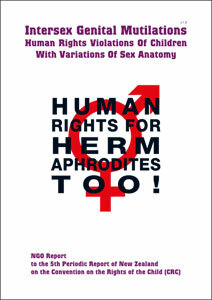 In collaboration with local intersex human rights defenders and their organisations, we will continue to denounce the ongoing practice in ever more countries to relevant human rights bodies, including CRC, the Committee against Torture (CAT), the Human Rights Committee (HRCttee), the Committee on the Elimination of Discrimination against Women (CEDAW) and the Committee on the Rights of Persons with Disabilities (CRPD). States as contracting parties to the Convention on the Rights of the Child and other applicable Covenants including CAT, CRPD, CEDAW and CCPR can no longer feign ignorance of the illegal nature of IGM practices, but now must take all appropriate measures including legislation to eliminate them, and to guarantee access to effective redress and justice for all survivors! 37. The Committee is concerned at the high prevalence of harmful practices in the State party, including child and forced marriage, virginity testing, witchcraft, female genital mutilation, polygamy, violent or harmful initiation rites, and intersex genital mutilation. The Committee is further concerned that, although the practice of ukuthwala involving children is considered as an ‘abuse of ukuthuwala’ and is a crime, as the State party noted during the dialogue, this practice still exists. (a) Develop awareness-raising campaigns and programmes targeting households, local authorities, religious leaders and judges and prosecutors, on the harmful effects of early marriage on the physical and mental health and well-being of children, especially girls. (e) Extend free access to surgical interventions and medical treatment related to their intersex condition to intersex children between the age of 16 and 18.